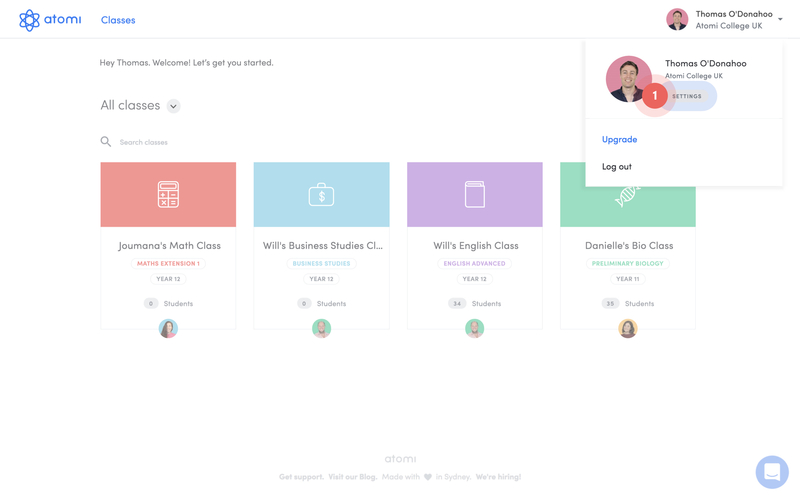 Setup mode allows you to invite users and set up classes on your account without anyone receiving invitations or notifications before the set up is complete. 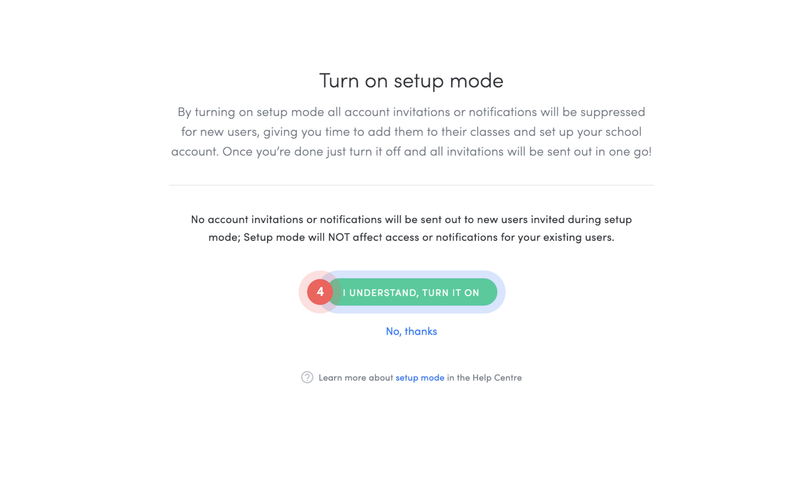 When setup mode is turned off, all the new users invited while setup mode was active will immediately be sent out an invite to join your account. 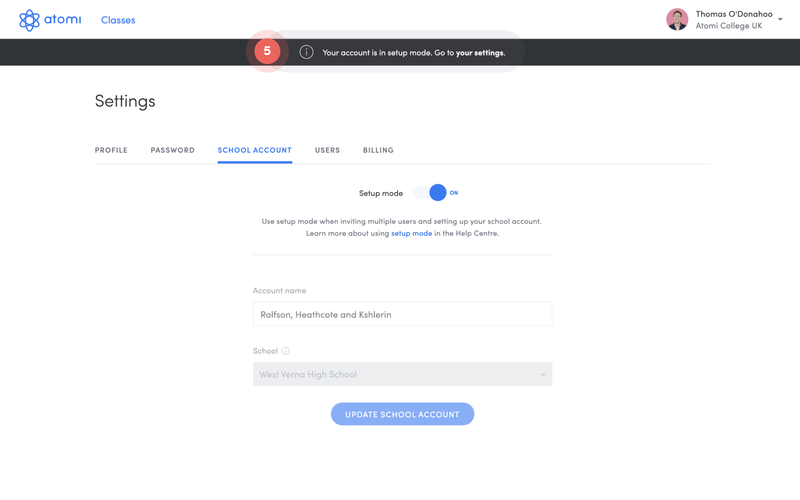 Any existing users that already have access to your school account won't be impacted by setup mode. Only the role of owner on a school account. Account administrators do not have the permissions required to turn on or off setup mode. If you're not sure who the owner of your school account is you can always contact our support team. 2. Click on the School Account tab. 3. 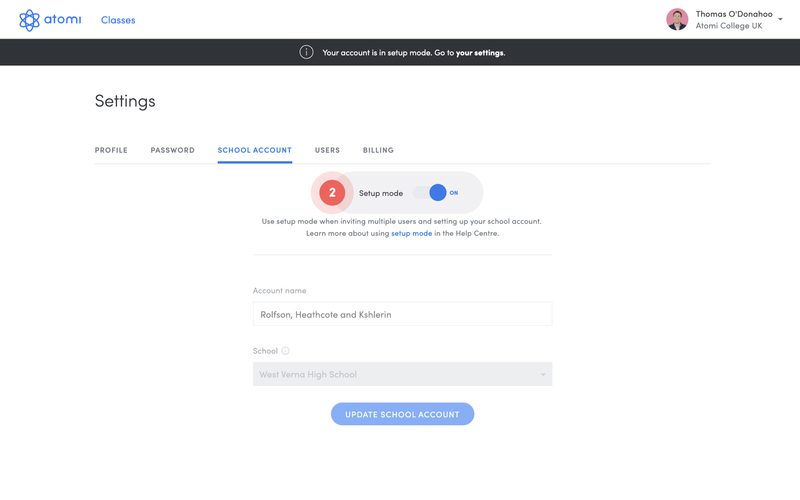 Under your school account settings, you'll see the setup mode option. Click the switch to turn setup mode on. 4. You'll get a confirmation screen to confirm what will happen and if you want to go ahead and turn it on. Click on the I understand, turn it on button to finish. 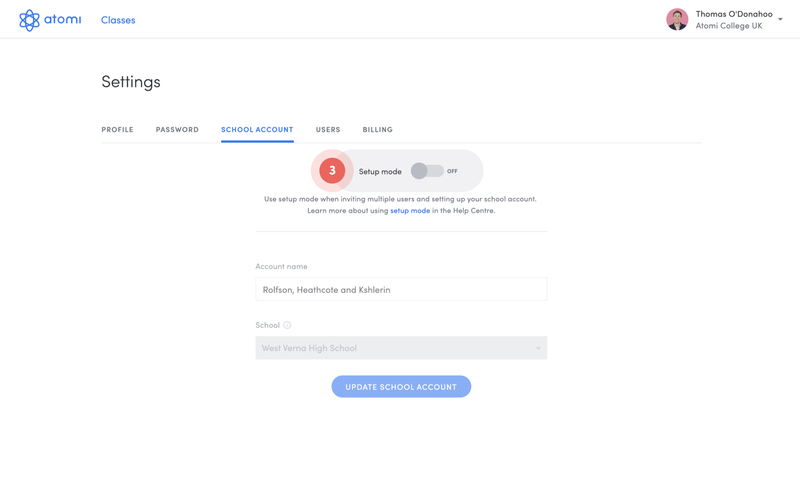 Once setup mode has been turned on you and any existing admin and teacher users will see an alert banner at the top of the page letting them know that setup mode is active and all invitations to new users will be suppressed. Please note: Before you turn off setup mode it's important to double check that all users have been added and all classes are correctly set up. 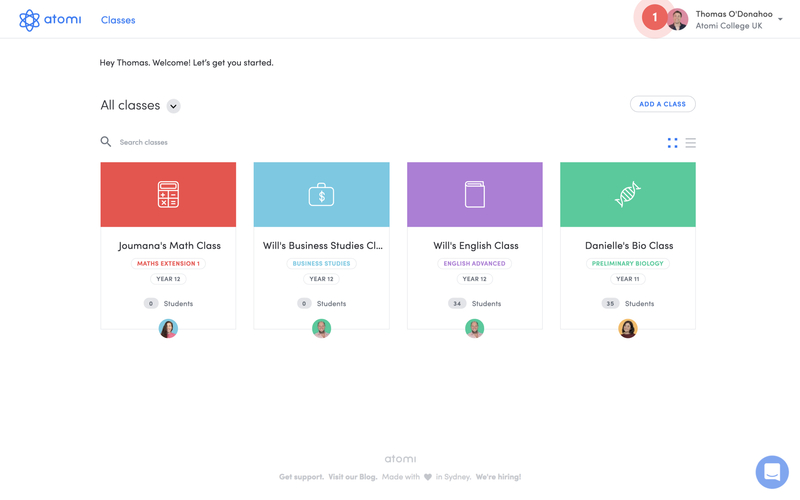 Although you can always manage users and classes when setup mode is off, it can be confusing for new users to receive an invite only to find out that some of their classes are missing. 1. 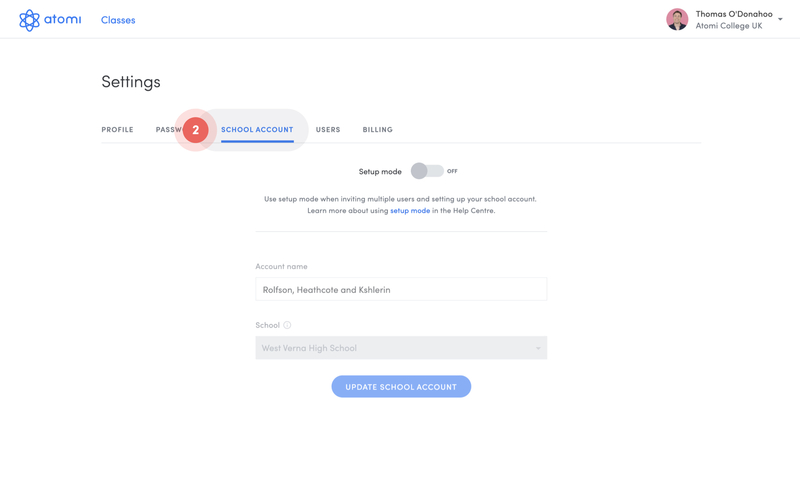 Go to your account settings by clicking on the Go to your settings link in the setup mode alert banner or your name at the top right of your dashboard as per step 1 above. 2. 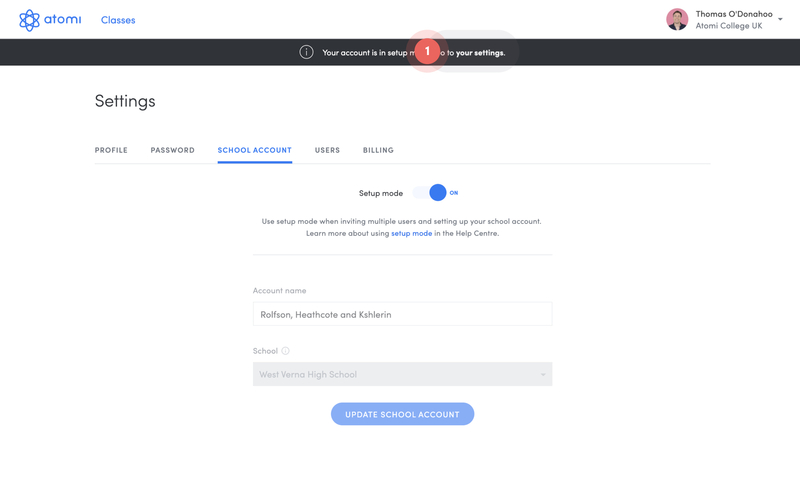 Under your school account settings, you'll see the setup mode option. Click the switch to turn setup mode off. 3. You'll get a confirmation screen to confirm what will happen and if you want to go ahead and turn it off. Click on the I understand, turn it off button to finish. That's it! 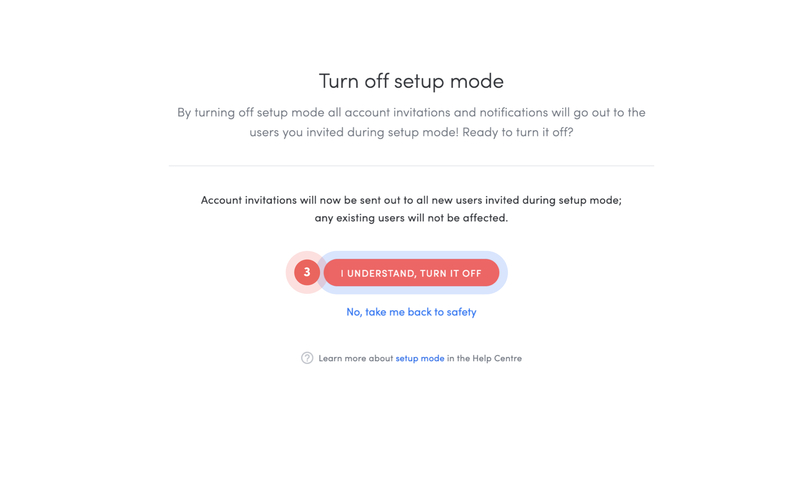 Once setup mode has been turned off all account invitations will be sent out to all the new users invited during setup mode.